“As ER warden, I try to visit Comox Bluffs Ecological Reserve at least once a month, from April to Oct. 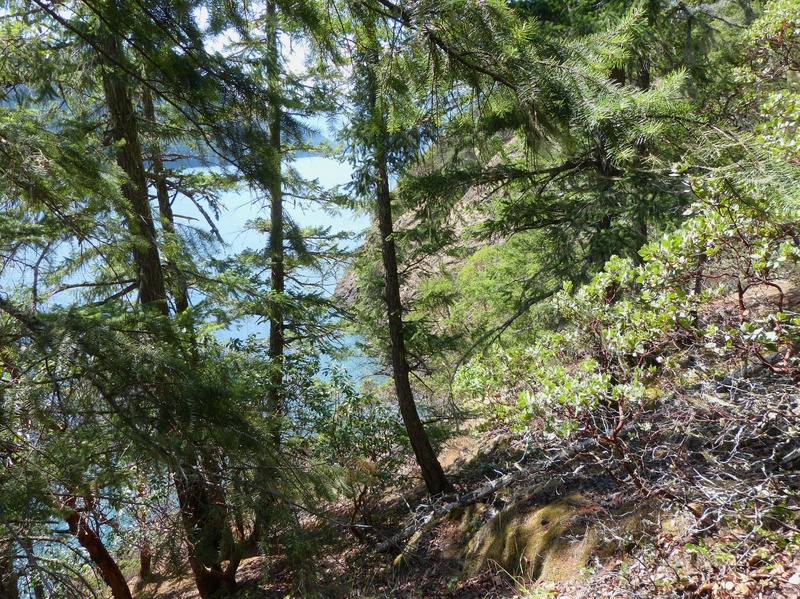 The CBER has two main components, lake level second growth forest and beach, and steep rocky bluffs supporting dry open-site plant communities. 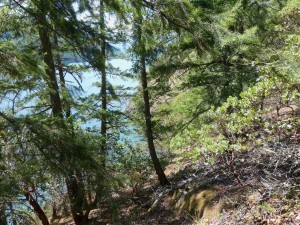 The beachfront forest is attractive and accessible to those who come by ATV or boat to camp,” but Amanda also reports on some abuse in campsites used by the public. It’s unfortunate that a few individuals abuse the privilege of visiting such a pristine ecosystem. “I visited the reserve yesterday, Tues 25 Aug. I arrived at the pullover about 11am, just as a loaded logging truck kicking up clouds of dust went by. Once it was gone, I was left with a gorgeous morning, broken cloud, warm and so quiet, only the sounds of firing from the nearby Fish and Game Club! As I entered the reserve, a young couple were walking out, carrying their tent and sleeping bags. I introduced myself, pointed to the no camping sign and said that I hoped they hadn’t left any garbage. They promised they hadn’t, and they didn’t look the type. 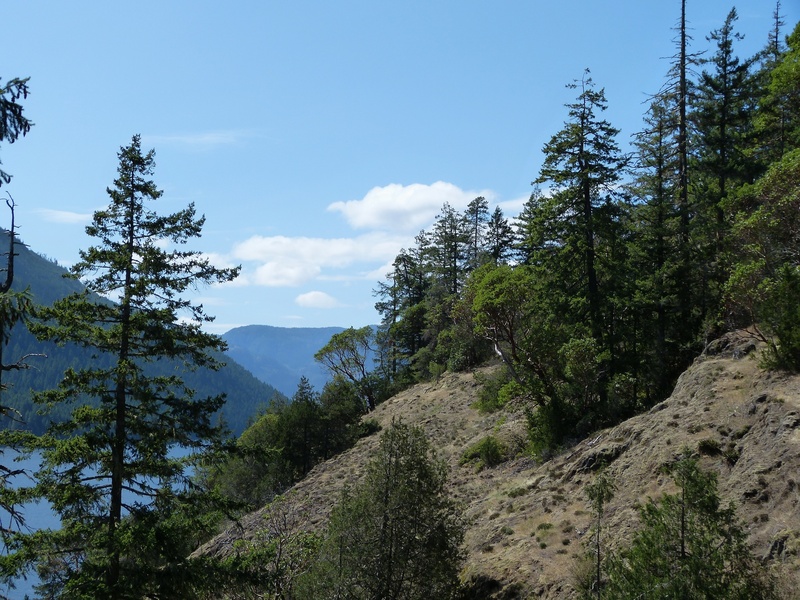 I hadn’t been to the NW corner of the reserve for a while, so I followed the old logging road up to the top of the bluffs and along the height of land. I dawdled along, soaking up the sunshine, the palpable peace, the sweet scents of the forest and sounds of the occasional bird. 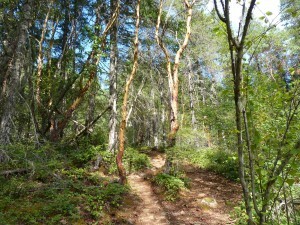 Of course it is very dry, the mosses and lichens are crunchy to touch and I noticed shrivelled blueberries and rosehips. Western St John’s wort is still in flower and at the NW corner I found a large and healthy stand of hairy manzanita. 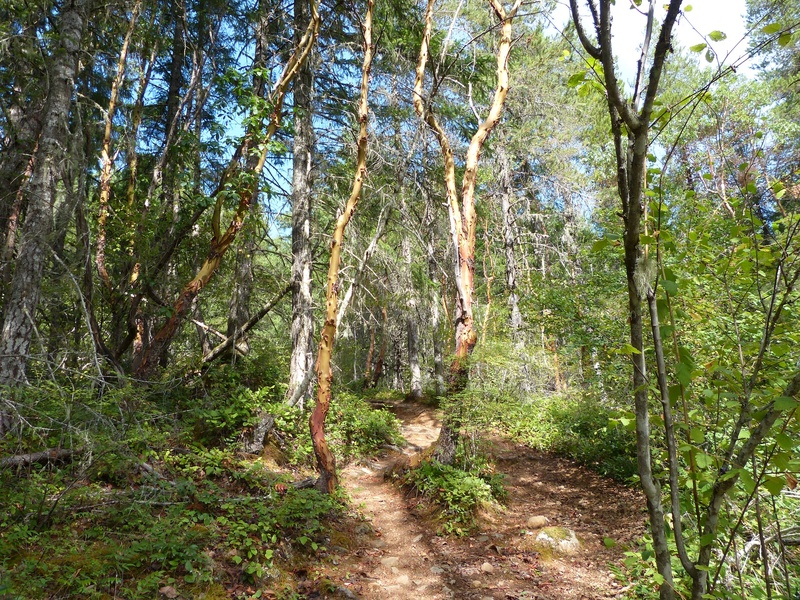 I marvelled also at the beauty of the arbutus trees along the trail; I recently read an article saying that with climate change, arbutus are dying in ‘alarming numbers’ along the coast due to various fungal diseases. Apparently the fungi thought responsible are endemic and not usually a problem, but with drought stress the trees are more susceptible and warmer wetter winters allow fungus to spread more easily. Which reminds me that I also read another article recently which said that tick populations in N America are booming due to climate change. Something to watch out for!